Our team's background is in construction and renovation, so our approach to every piece - whether it's a table or a floor to ceiling design, takes functional considerations into account. We bridge the gap between fabricator and designer with our in-depth knowledge of the building and installation process. Form and function go hand in hand, an approach that creates a timeless piece that will last a lifetime. Whether we're creating a piece for a home or business, we work closely with you and your designer to make your dream a reality. Each handcrafted piece of wood and metal is unique, but every piece is created with the same commitment to quality materials and craftsmanship. 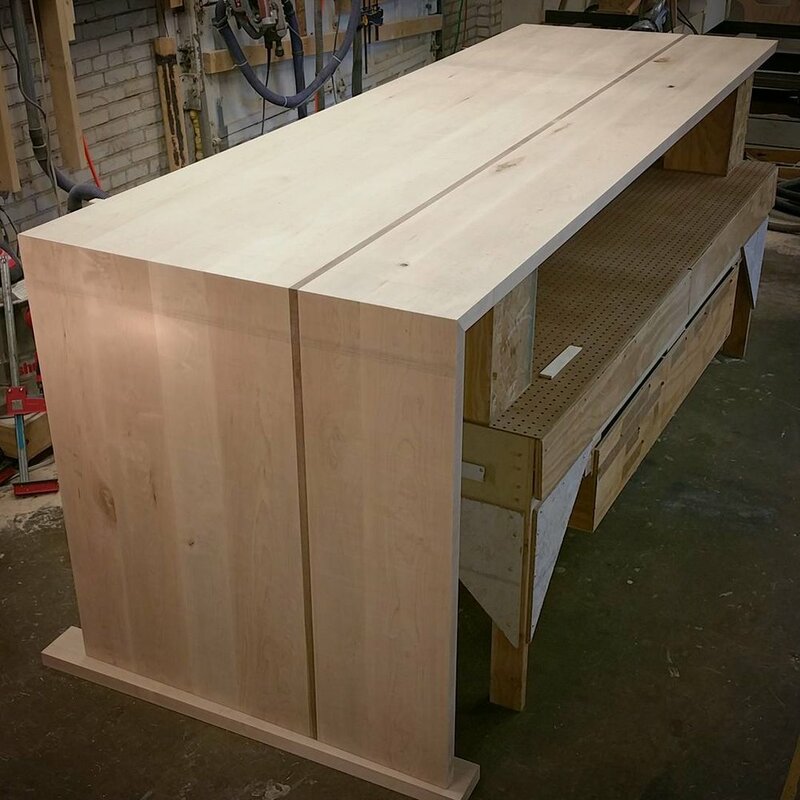 Custom crafted furniture and installations have a unique process that each client must understand to arrive at the best outcome. We work closely with you and your designer throughout the entire process, ensuring our work is aligning to your vision. Our goal is to create your next heirloom, so we take the time to get it right. In the first step of the design process, we share each others' ideas, thoughts and inspirations. This may be in the form of words, pictures, emails, sketches, coffee, or anything else that inspires you or us. The client is an integral part of this process and your ideas, input and desires are the most important aspect of our design. In this stage, we convey the vision for the project through concept sketches, models, pictures - or any other medium needed to visually communicate the project in an artistic but realistic manner. This delivery will also capture the functionality, tone, style, and feel of the project. The client's feedback is critical at this step and is always taken into consideration before moving forward. Wood, paper, textures, steel, leather, finishes, colors - design is all in the details, and we want to make sure we choose the perfect materials for the project at hand. The wood we use is locally sourced from the Richmond, VA area and is mainly walnut, maple, oak, cherry, or reclaimed heart pine. The bases of our pieces are made from steel and are fitted with adjustable feet, which allows us to laser level each table or installation to your specific space. The metal is finished in either satin black, polished or patinaed steel with a natural linseed oil seal. Before a project is started; before the first piece of wood is cut or iron is welded, we send each client a finalized plan with all the specifications, including a final price. Nothing is built until the design matches your vision and you are ready to move forward. 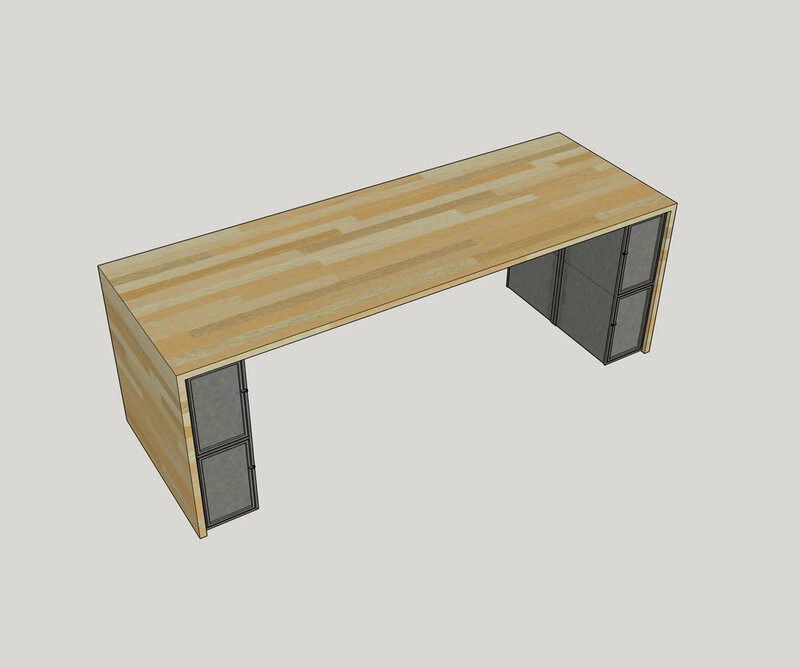 Your entire project will be created in-house by our select network of craftsmen, fabricators, and suppliers. Every step of the production process is closely monitored to make sure the project is being produced according to the plan we have created together. After the wood is hand shaped to finished dimensions a base is designed to compliment the natural beauty of the wood. The wood varies from 1 1/4″ and up in thickness of true solid wood. Whether it's delivering a piece of furniture or installing multiple items, we do our best to make sure this step is done correctly, efficiently and with respect to your home or business. We do not leave until you are satisfied with your custom Iron Oak piece. We are excited to help you bring your design and vision into reality. We are passionate about working closely with clients to create the perfect piece that will become their next heirloom. If you are looking for a piece that's as unique as you, your family or your business, then get in touch. Let's start designing - together.